British Hang Gliding and Paragliding Licensed flying school. Why not try the fastest growing airsport in the world. A paraglider is aviation's lightest free flight aircraft, simply a wing capable of flying cross country that fits in a small bag. Available to every one from 16 to 65 years. 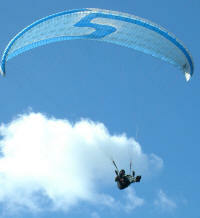 Open all year for beginner paragliding courses and holidays. Our unique multi directional private flying site offers the best training facilities in the south. We teach and fly on the beautiful south downs home of hang gliding and paragliding. Based at Shoreham Airport just 10 minutes from our main paragliding sites at Steyning and close to the South's major flying sites. Steyning is recognised as the best training site in the country and the only site that can be flown in all wind directions. Small group sizes taught on modern certified equipment by dedicated instructors ensures faster progression.